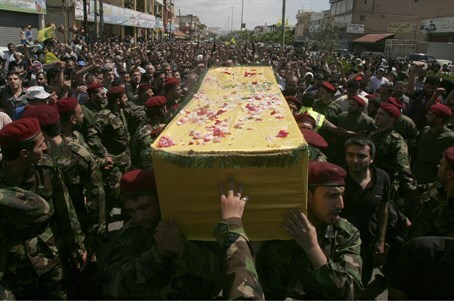 Body of Hezbollah commander Hussein Salah Habib returned to Lebanon after he was tortured and killed by Syrian rebels. A Hezbollah commander, who had been missing for months in Syria, was buried in Lebanon on Wednesday after his body was repatriated following his torture and killing by rebels, relatives told the AFP news agency. Hussein Salah Habib, 30, was captured by opposition fighters during the fight for Qusayr, a strategic town near the Lebanese border that fell to the regime on June 5. He was buried in Baalbek, in the Bekaa valley, a region of eastern Lebanon that is a bastion of Hezbollah, reported AFP. Armed Hezbollah members and fighters who participated in the battle for Qusayr were among those at Habib's funeral, an AFP correspondent reported. His body had been missing for months, and was recovered nearly a week ago in the area of Tallet Mando, near the town. "He was repatriated and DNA tests proved that it was indeed Hussein," a relative said. "We were told that his body was buried under a mound of sand. He had been stabbed in several parts of his body and his face was disfigured," he added. The battle of Qusayr is a turning point in Hezbollah’s participation in the Syrian civil war. The group first claimed it sent fighters to Syria in order to protect sacred Shiite religious sites against potential attacks by the Sunni rebels. Once the group helped the Syrian regime’s army retake Qusayr, it could no longer hide the fact that it was actively involved in the Syrian war. Hezbollah has sustained heavy losses in the Syrian war and has reportedly been paying the families of its fighters killed in Syria to keep quiet about the circumstances surrounding their relatives' deaths. Hezbollah chief Nasrallah has promised that his group will be wherever is needed in Syria and has even declared he was willing to go fight in Syria himself. The Syrian Observatory for Human Rights says at least 262 Hezbollah fighters have been killed in Syria since the beginning of the conflict in March 2011. Hezbollah’s stronghold in the southern suburbs of Beirut was hit by two car bombings this summer, one of which killed 27 people. Bombings in the mainly Sunni northern city of Tripoli in late August also killed 45 people, and ongoing fighting in that city between rival militias supporting different sides in the Syrian civil war have killed scores more.